For a more authentic version, use tomato puree instead of crushed tomatoes and replace the Bombay Biriyani Masala powder with an equal measure of Punjabi Chole Masale or Chole Masala Powder. However trust me and try this recipe once. I am sure you'll like it. Drain and put the soaked chickpeas in the pressure cooker along with 2 1/4 cups of water, 1 bay leaf, 1/2 tsp of salt and a tea bag. The water should cover the chickpeas completely. Bring the water to a boil then close the lid of the cooker and cook over medium heat for 3 whistles. After that reduce the heat to low and cook for another 8-10 minutes before switching off the heat. Wait for the steam to escape before opening the lid of the cooker. Strain the cooked chickpeas and reserve the water. In a large kadhai or saucepan, heat the oil over medium heat. Add cumin seeds and cloves to it and cook until fragrant. Add the chopped onions, garlic and ginger and cook till the onion browns slightly at the edges. Add the crushed tomato and mix well. Stir in the cumin, coriander and Bombay biriyani masala powder and cook till the raw smell of tomato disappears completely and the gravy reduces 20 % by volume. Add the cooked chickpeas and combine so that they are well coated with the gravy. Add 1/2 of the reserved water, season with salt, place the lid of the pan and stirring occasionally cook covered for 20 minutes. Add the remaining water, check the seasoning and cook uncovered for another 10 minutes or till the gravy has acquired the desired consistency. Switching off the heat, garnish with chopped coriander and lemon wedges and serve with roti or rice. Happy new year and fabulous chickpea curry. Loved the colour. I hope your New Year is off to a great start and this dish sounds perfectly warming for some of these cold winter days! 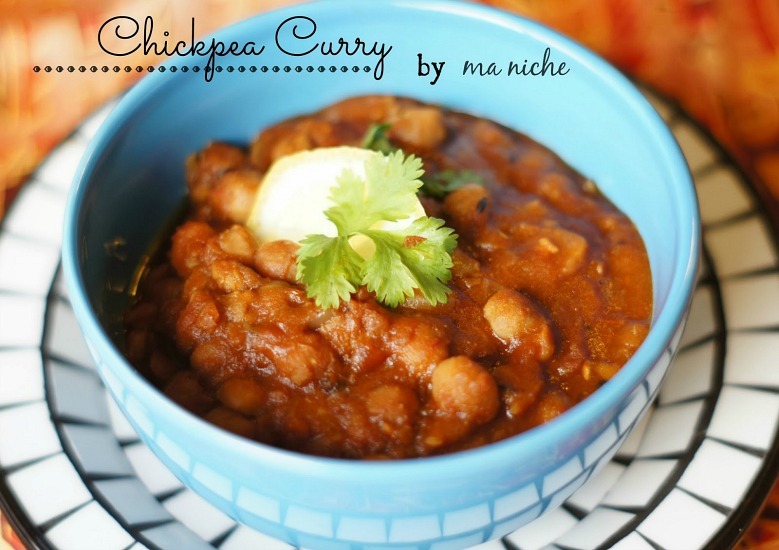 I've been thinking about making a chickpea dish. I only know summer ones…this is perfect for the cold weather. thanks for sharing it on foodie friday. Pinned. 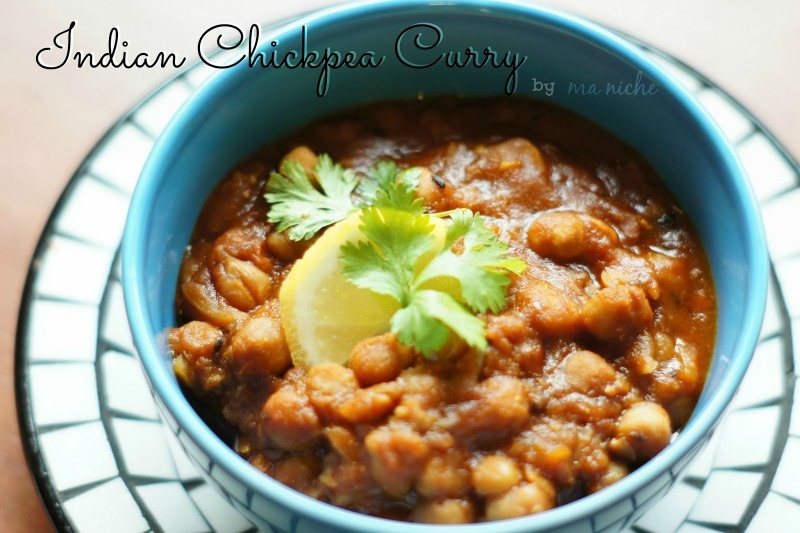 Your Chickpea Curry looks wonderful! Thank you so much for sharing with Full Plate Thursday and have a great weekend!